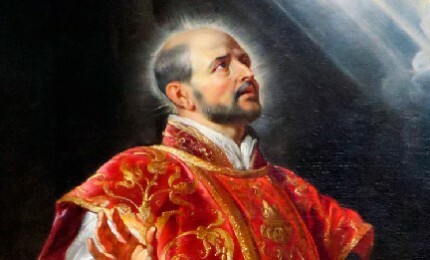 Ignatius of Loyola (Azpeitia, Basque Country, 1491 – Rome, 31 July 1556) was a Basque soldier and then a priest who became a religious leader during the Counter-Reformation. His devotion to the Catholic Church was characterized by absolute obedience to the Pope. He founded the Society of Jesus and became its first Superior General. It prospered to the point that it had around one thousand members in more than one hundred houses – most of them colleges and training houses – distributed in twelve provinces at the time of his death. His Spiritual Exercises, published in 1548, had a remarkable influence upon the subsequent spirituality as a tool for discernment. The Catholic Church canonized him in 1622, and Pius XI declared him the patron of spiritual retreats in 1922. The Society of Jesus (Societas Jesu, S. J. ), whose members are commonly known as Jesuits, is a religious order of the Catholic Church founded in 1534 by Ignatius of Loyola, together with Francisco Javier, Pedro Fabro, Diego Lainez, Alfonso Salmeron, Nicolas de Bobadilla, Simão Rodrigues, Juan Coduri, Pascasio Broët and Claudio Jayo in the city of Rome and approved by Pope Paul III in 1540. With 17,676 members in 2012 (priests, students and brothers), it is nowadays the largest Catholic male religious order. It carries out Catholic educational, social, intellectual, missionary and media activities. Education is undertaken by the Society of Jesus as a participation in the evangelizing mission of the Church. Therefore, their centres offer society, according to their own criterion, a clear Christian inspiration and a liberating and humane education model. Jesuits have institutions at all educational levels: universities, schools, vocational training centres and educational networks. The Society has 231 higher education institutions (universities) the oldest of which is the University of Deusto in Bilbao, Basque Country, 462 secondary schools, 187 primary schools and 70 technical or vocational schools in 69 countries,. 130,571 lay people and 3,732 Jesuits work in them as teaching or administrative staff. Moreover, there are Educational Networks (mainly Fe y Alegria – Faith and Joy – in Latin America) with 2,947 centres. The total number of students is estimated at some 3 million. Jesuits have founded educational centres in all the continents; in 1640 they already had 500 higher education centres distributed all over Europe and the Americas. This figure increased over the following century and it became the most important educational network at the time: more than 800 schools and universities at the time of its suppression. The methods they used in education were renowned and mainly based, since 1599, on the Ratio Studiorum and on the 4th Part of the Constitutions of the Society. In 1986 they updated their educational methods and paradigms through the document Characteristics of Jesuit Education, which was followed in 1993 by Ignatian Pedagogy: a Practical Approach. Some noteworthy former students at Jesuit centres are: Descartes, Voltaire, Cervantes, Quevedo, Saint Francis of Sales, José Ortega y Gasset, Antoine de Saint-Exupéry, Charles de Gaulle, Vicente Huidobro, Alfred Hitchcock, Vicente Fox, Fidel Castro and James Joyce.